Derry City youngster, Jack Malone receives his Player of the Month award from manager, John Quigg. Derry City youngster Jack Malone has been rewarded for his excellent form by being named the latest Watson Menswear Ulster Senior League Player of the Month. Malone’s eye-catching displays in January sees the Candy Stripes midfielder take the prize. Malone was instrumental as Derry City defeated Letterkenny Rovers 2-1 on the resumption of the action in the New Year at the Brandywell, scoring one of the goals in a fine win. Malone excelled as Derry beat Fanad United at Traigh-A-Loch and created the assists for both goals when John Quigg’s charges defeated Finn Harps Reserves 2-1. Malone is one of the latest production line waiting in the wings to make a step at Derry. 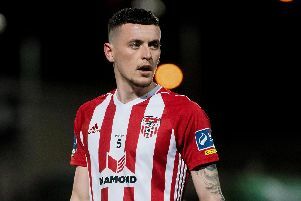 Malone has been a consistent performer for Derry in the USL this season and the Watson Menswear USL Player of the Month Award is a fitting honour for a player on the rise. The USL Player of the Month award is sponsored by Leonard Watson of Watson Menswear, Main Street, Letterkenny.